Contractor badges for build up and breakdown for all contractors/exhibitors will need to be downloaded or requested before the event to access the halls. For security reasons these badges must be worn at all times in the hall and will be required our staff to gain access into the hall. NB: Exhibitor Badges can be used to access the halls on Sunday 22nd September. Exhibitor badges & Data Capture Devices can be ordered before the exhibition online. A unique URL will be emailed to you from the registration company Circdata where you can create your own unique username and password. Please note Badges must then be collected onsite at the registration desk during the build up of the event. Please see below registration open times. For security reasons these badges must be worn at all times in the hall and will be required for your staff to gain access into hall. The Organisers Desk & Sales Office will be located in the foyer section of Hall 1 . The office will be open from 0800 hours Friday 20th September, please come and see us with any queries that you may have. The hall will be open from 0800 until 17.30pm on open days. If you would like visitors to enter the hall before the show open times please contact Operations or come and see us in the organisers office during the event. All meeting and functions must end by 5.30pm on Monday & Tuesday in the hall and must not overrun. No meetings can exceed 4pm on Wednesday 25th September. 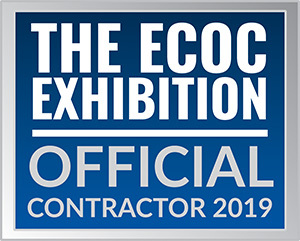 All Official Contractors for ECOC 2019 will show the Official Event Logo shown. The RDS is located in Ballsbridge, close to the centre of the city. We do advise you to book through the official channel; As our trusted supplier, they have exclusive accommodation rates at all surrounding hotels and will ensure you receive the best experience and the best rates. Find out more about this year’s location and how you can get the most out of your time in Dublin. In case of additional questions or requests, please do not hesitate to contact the service-team. If you require a letter of invitation for visa purposes, please complete the Letter of Invitation Form. Please note ECOC management is not able to contact Embassies on behalf of any individual wishing to attend the ECOC Conference & Exhibition. For full details CLICK HERE. Twenty-four hour security will be provided throughout the tenancy. However, the organiser expressly decline responsibility for any loss or damage which may befall the person or property of the exhibitor. The exhibitor must take responsibility for the security of all items in their stand and personnel items. Show Management & Security personnel will try to guard against theft and damage, but the ultimate burden falls on the exhibitor. Make sure you arrive prior to the official opening time and do not leave your stand at night before visitors leave the centre. Business tools such as laptop computers, recorders, calculators and give away items are the things most often stolen. They should be guarded and stored safely at night. Thieves will also take personal items such as purses, mobile phones, suit coats and toolboxes. Do not leave personal items unprotected in your booth. Alternatively items can be removed from the building. Pass out authorisation can be obtained from the organisers office. Please note that the build-up and dismantling days are vulnerable periods. Companies are recommended to never leave their stand unattended and to take all valuable and portable items with them as soon as the exhibition closes. Please ensure that any incident involving the loss of property is reported promptly to the Organisers Office. Failure to do so could result in refusal by insurance companies to meet your claim. Lost property can be collected from the organisers office during the event. However, after the event all items will be given to the venue. Consider covering your exhibit with some sort of cloth at the close of each day. The psychological deterrent makes it more difficult for people to handle merchandise or take photographs of your products. Criminals often look for the easy target first. You can hire your own security guard for your stand at your cost. We urge all exhibitors to have insurance for all personal items & business equipment (in the event of theft or damage), accident insurance and public Liability to cover visitors to the stand. 1. Lodge a written complaint within 24 hours with the exhibition organisers & the local police to obtain a crime number. 2. Take any steps required by the laws and regulations in force to maintain recourse against third parties. There will be free WIFI access available in the exhibition hall but please note this will only be suitable for browsing the internet and is not suitable for downloading or streaming. We advise you order a hardwired connection if you need continuous access to the internet, this will not affect the free network service we are providing. If you are showing Demonstrations or making presentations you will need to order a hard wired internet connection for your stands as we cannot guarantee the speed or access to the wireless network. Hard wired connections can be ordered through the RDS. It is strictly prohibited to create your own Private WIFI Network with a router. This will interfere with the free service to the network that we the organisers are providing. Any network that us the Organisers or the RDS have not been notified of will be closed down as any private networks can be located within the hall. PRESS REPRESENTATIVES WHO ARE CORRECTLY BADGED ARE ONLY ALLOWED TO USE THIS ROOM. Exhibitors can drop their press packs on Sunday 22nd September to the organisers office and hand to the member of staff. Catering points are located within the RDS for drinks and snacks. Exhibitors can place their stand catering through the official catering company. Your catering order will be delivered to your stand at the day and time of your choice. Exhibitors are strongly advised to take advantage of the stand catering facility to meet their requirements during exhibition open hours to avoid queues at the restaurant & cafes within the venue. Please note that it is not possible to bring your own catering into the RDS including water, wine, coffee machines etc. Photography must be limited to just images of your own booth. Photography is prohibited on the exhibition floor. Any photography and videotaping must be approved by the exhibition organisers. Please visit the organiser’s office to submit your request. Photographing & recording of other companies products and stands is strictly forbidden and we the organisers have the right to eject anyone from the exhibition caught doing so. We do strongly advise you cover your displays overnight, this will discourage any persons wishing to take photos before the show opens. As Organisers we take a very strong view on Copyright infringement; any company reported infringing these rights will be immediately ejected from the exhibition. If a successful prosecution is bought by the affected company, a further ban would be imposed on the prosecuted company from exhibiting at future ECOC events. All promotional material must be handed out from your stand area, companies are forbidden from handing out leaflets in public areas ie: Catering points, registration areas and venue restaurants. Please come to the organisers office located within hall 1 and report any medical instances. The paramedic will attend to where the incident has occurred, once it has been reported. During the exhibition its use has to be restricted to Organisers announcements and emergencies only. All the visitor entrances to the RDS are wheelchair accessible. Wheelchair hire is not available at the venue and this should be arranged via your own medical service or first aid provider. If you need to book a disabled car space, please contact us the Organisers. There is a cash point located in Hall 1. Smoking, drug taking and the consumption of alcohol are strictly prohibited inside the venue premises AT ALL TIMES. All users of the RDS are requested to comply with, and to enforce these rules everywhere in the premises. Smoking areas are located outside the entrances to the building. No person under the age of 18 years can be admitted to the exhibition either during build-up, open days or breakdown. This rule also applies to the exhibitors/contractors children. The organisers have to rigidly enforce it to comply with the safety regulations of the exhibition. There are cloakroom facilities at the RDS . There will be a minimal charge for this service. There is parking available around the venue. The ECOC team is warning all exhibitors not to respond to any correspondence sent to them by Exfo-Guide/Fairguide.com operating out of Slovakia and previously Mexico. Some exhibitors had received a solicitation from this company that claims to be collecting descriptions for the Exhibition Show Guide for ECOC 2018 and will do again for 2019. The form for completion has been constructed to obtain a three-year financial commitment and cleverly headed to give the impression that it is for the ECOC guide. We have been warning exhibitors for several years regarding this deceptive practice including a company called FairGuide/Construct Data based in Austria which could be the same company and was actually sanctioned by the Austrian Government due to their deceptive practices. ECOC is no way affiliated with this/these companies. If Expo-Guide/Fairguide contacts you either by e-mail or letter regarding purchasing advertising space in any ECOC related publication do not respond to them and do not give them credit card information.